KJS: How did you become so closely associated with The Rockin' Berries? BL: I became so closely associated with the lads from schooldays. In the same class as Geoff Turton and Bryan [Chuck] Botfield. They played clarinets in the school band, I played tuba. We have remained friends over the years and when I retired from my proper job to become an OAP they selected me to manage their 50th Anniversary year. An honour indeed. KJS: I note with interest that there is a link between the The Berries and Fleetwood Mac. Can you elaborate? BL: Chuck left our SM school to go to Moseley Art School. He formed a skiffle/rock band called The Bobcats, later to become the Berries. The pianist was a young lady whose name was Christine Perfect [later Christine McVie]. She later formed Chicken Shack ["I'd Rather Go Blind" - UK #14; 1969] and then became part of the Fleetwood Mac phenomenon. KJS: Tell me about your longstanding friendship with Geoff Turton. It started at school and then with The Chimes didn’t it? BL: Back at Turves Green Secondary Modern, Geoff Turton formed a band that we named The Swingin' Chimes. I was the singer. We were quite busy on the Midlands scene with a regular spot at The Orchid Ballroom in Coventry - then under the management of Larry Page. Our biggest claim to fame was probably playing with The Beatles at Smethwick Baths in October 1962. "Love Me Do" had just charted. KJS: In my recent interview with Rick Price, the connections with fellow Midlands band Sight 'n' Sound soon became apparent. Rick is not the only member of The Berries who has a link with Sight 'n' Sound and by extension Roy Wood and Wizzard. What are the other parts of this musical membership interchange? BL: When Geoff first left the Berries, and prior to having his solo hits as Jefferson, he joined a band named Sight 'n' Sound. Rick Price, now playing with the Berries, was the bass man. Unfortunately, it didn't last too long because Roy Wood came calling and Rick joined The Move. KJS: The Berries also played at that famous venue The Marquee back then, as did The Move. What are your memories of those days? BL: The Marquee is very special to the Berries. After doing a gig there, PJ Proby and his manager Kim Fowley heard the Berries and were impressed. PJ invited them to a party and it was there that Kim Fowley suggested they do a cover of the US hit "He's in Town" written by Goffin & King. The Berries version was cut and was in the shops within seven  days! And the rest is history, as they say. KJS: Did The Berries cross paths with Mike Sheridan, The Idle Race, Jeff Lynne, Roy Wood or The Move at that time? 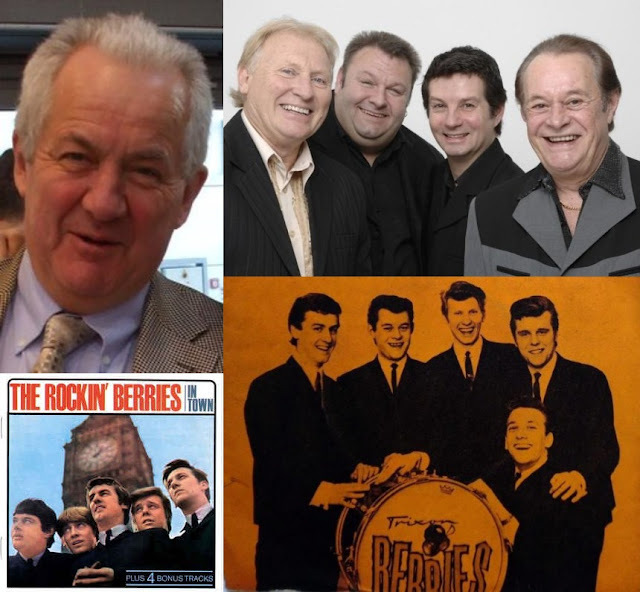 BL: Yes, the Berries and the Chimes played with Mike Sheridan and The Nightriders a number of times in the early Sixties. It has been said that by the year 2050, half the world's population would have either been an Elvis Presley impersonator or a Nightrider! KJS: So here in 2011, The Berries are touring again and celebrating their 50th Anniversary. Tell me about what you would consider the absolute high point of The Rockin' Berries career? BL: The high point of The Rockin' Berries career has to be appearing on The Royal Command Performance back in 1967. We were only the second beat group to do so after The Beatles. The famous after-show story about Tommy Cooper asking the Queen if he could have her FA Cup Final tickets happened that year ... and stood next to him were ... The Rockin' Berries! KJS: The tour is now well under way. The Berries are playing all around their Midlands heartland and beyond. What have been the audience reactions this year to the tour? BL: The first two concerts of the 50th Anniversary tour were both sell-outs and the opener at The Palace in Redditch was a real high with amazing chemistry between the lads and the audience. It was almost a throwback to the Sixties. As Geoff said: "In those days we had screaming girls storming the stage. We still get the odd scream, but nowadays we have to give them a hand up!" KJS: I know that the guys are playing in my home town Wolverhampton’s Wulfrun Hall on Saturday 12th March. How can folks find out about the current tour and buy tickets? BL: All the tour dates are on The Rockin' Berries web site and also on our Facebook page. KJS: Finally Bob - a question that I always ask! What are your favourite ELO songs? BL: Favourite ELO track? Mine would be "Turn To Stone". But Geoff, being a 'blue nose' [Birmingham City fan], would pick "Mr. Blue Sky" - which prompts me to think this: Us Wolves [Wolverhampton Wanderers] fans will have to come up with a new song to chant when the 'Blues' come to 'Molineux' - because now they have actually won something! Once again, my wholehearted thanx are extended to Bob Lawton for sparing his time and agreeing to participate in this interview. ELO Beatles Forever [ELOBF] recommends Rick Price and The Rockin' Berries to those enlightened folks who enjoy the music of ELO, Jeff Lynne, Roy Wood, Wizzard, 'Brum Beat', The Move, The Idle Race, The Beatles and related artistes.